I use a lot of videos in class these days. There’s no shortage of inspiration for film lessons online, and a bit in print too. We received a copy of Film in Action last June, which Martin Sketchley reviewed here. This book (plus the accompanying website, Film English) has great resources and ideas for using videos in class. There are some other brilliant sites to bookmark – notably All.at.C and Vocabulary in Chunks, which choose some great clips to build lessons around! The best resource I’ve ever come across for using movies in class was Shrek in the ESL Classroom by Brian Boyd (of Grammarman fame). When I create my own video resources I often find myself delving into this booklet. Anyway, here’s something I made recently. 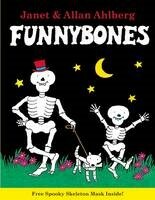 It’s based on a classic kids cartoon called Funnybones (which were great books too). I used it with my 10 year olds during Halloween and it went down well. This post is less about the actual video, and more about showing some example activities to use with short film clips. I hope it gives you some ideas for making your own lessons using videos, especially with YLs.